Joan Rockwell-Gifford, North Suffolk Garden Club member, recently was promoted to GCA Approved Floral Design Judge. 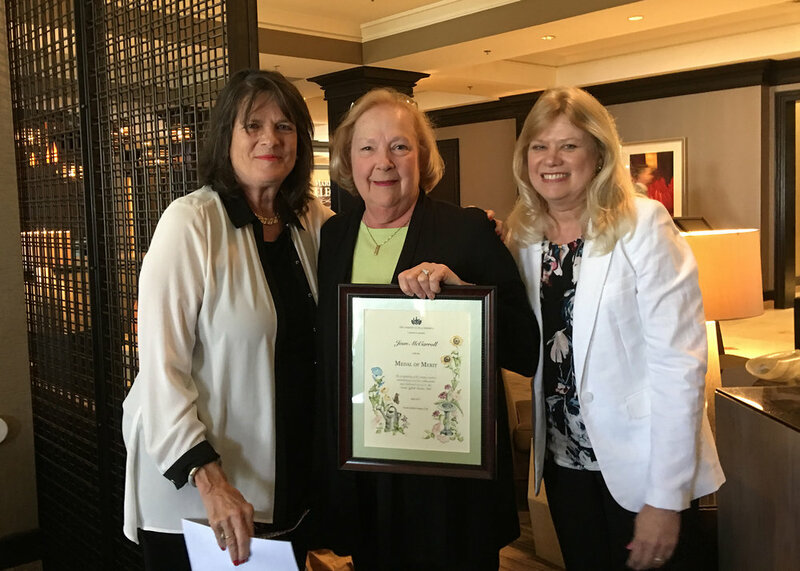 A talented floral designer and former NSGC president, Joan was presented with the judge’s pin by Libby Smith, a GCA Approved Horticulture Judge. In April, North Suffolk Garden Club with The Garden Club of America presented Jean McCarroll with the Medal of Merit Award in recognition of her many creative contributions and her enthusiastic and dedicated service to North Suffolk Garden Club. Jean designs many Flower Show Schedules, invitations and the club directory as well as serving on the conservation committee. She is a premier rose grower in her spare time. Pictured, left to right, Jennifer Lawrence, NSGC president; Jean McCarroll; and Deanna Muro, NSGC awards chairman. 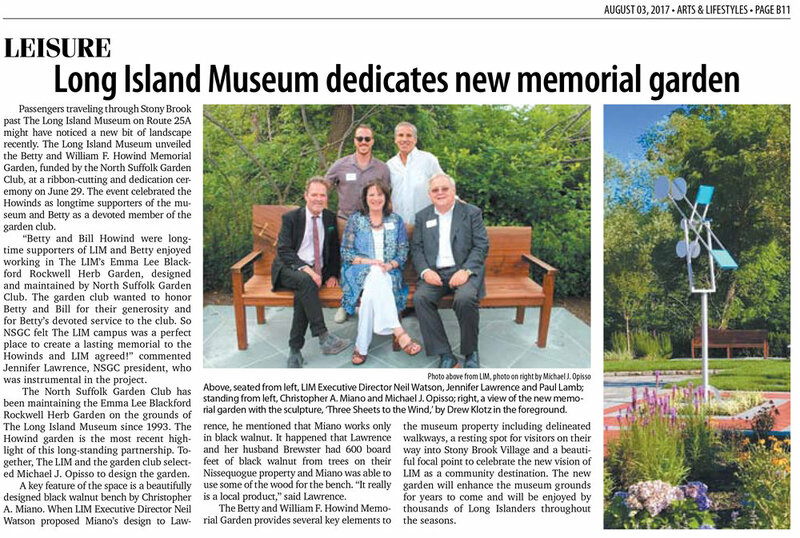 North Suffolk Garden Club’s talented floral designers created seven centerpieces for the Long Island Museum’s 2015 Holiday Celebration Gala and Silent Auction. Members of the North Suffolk Garden Club recently participated in the Stony Brook Yacht Club Mariculture Program that called for volunteers to help with the distribution of the oysters and clams that were raised in cages and rafts this year to help build a small oyster sanctuary. The objectives of this program are to provide environmental and ecological benefits and jump start oyster restoration in Stony Brook Harbor. The Garden Club of America has granted Cynthia Donahue Emeritus status after a distinguished career as a GCA Photography Judge. This recognition reflects Mrs. Donahue’s contribution to the GCA and its judging program. She received the award at a recent lunch in her honor where NSGC president Jennifer Lawrence noted her many accomplishments. "Cindy is no stranger to being honored,” said Mrs. Lawrence. “Over the years, Cindy has received a GCA Medal of Merit, a Photography Creativity Award and the Zone Judging Award. “Cindy has been helpful to so many of us over the years and we are delighted to present this award on behalf of the GCA." North Suffolk Garden Club this year funded a Pollinator Fellowship through the Garden Club of America Board of Associates Centennial Pollinator Fellowship program. Recipient Gabriella Pardee, a PhD student in the Ecology and Evolutionary Biology Program at Dartmouth College, researches the effects of climate change on plant-pollinator interactions. This fellowship will enable her to conduct field experiments in which she manipulates snowmelt timing and frost exposure to examine how plants, pollinators and their interactions respond to earlier snowmelt and increasing temperatures.